Clintonville Memory Project includes digitized items pertaining to the history of Clintonville. This collection, a part of the larger InfoSoup Memory Project, will continue to grow as more items are digitized. A list of the Clintonville Mayors from 1887-present was compiled by Mayor Judith I. Magee. The Library staff has compiled a History of the Clintonville Public Library. InfoSoup has pages devoted to Local History and Digital Collections available from InfoSoup Libraries and from other state and national resources. 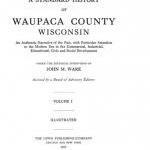 The digital collections of the Wisconsin Historical Society contain full scans of books on the history of Waupaca County. MyHeritage Library Edition provides access to a vast collection of Census records, family trees, birth, marriage & death records, immigration and military records, directories, passenger lists, and more!